UPDATE 4.23pm: SAM the koala was a symbol of Victoria's resilience after the bushfires and her death is 'tragic', Kevin Rudd says. 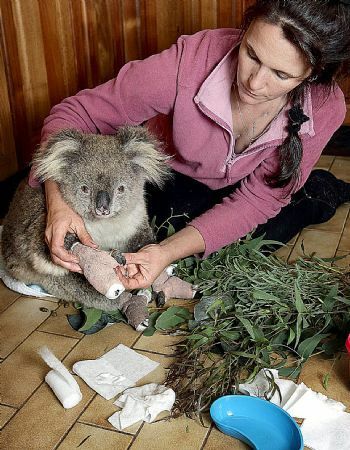 Sam, whose image was seen around the world in the aftermath of the Black Saturday bushfires, was expected to undergo surgery today to treat cysts as a result of urogenital chlamydiosis, a life-threatening disease that affects 50% of the koala population. This afternoon, vet John Butler told waiting media outside Morwell Veterinary Clinic that due to complications with the disease, the best course of action was to put Sam down. Prime Minister Kevin Rudd led the national mourning for Sam, describing her as an enduring symbol of Victoria’s resilience in the face of the Black Saturday fires. “It’s tragic that Sam the koala is no longer with us,” Mr Rudd said. The PM was informed of Sam’s death this afternoon during talks in Cairns with Pacific Island leaders. “I just heard this before I came in,” Mr Rudd told journalists. “Very interesting, when I travelled to London for the G20 summit in early April, the symbol of hope for so many people around the world was the great picture of that wonderful koala being fed water by one of our firefighters. “I think that gave people of the world a great sense that this country, Australia, could come through those fires as we have.